I love to wear dresses. One simple decision and boom – you’re about 95% dressed. Living in a warm climate, dresses are cool – and can be layered later in the year with tights and jackets. 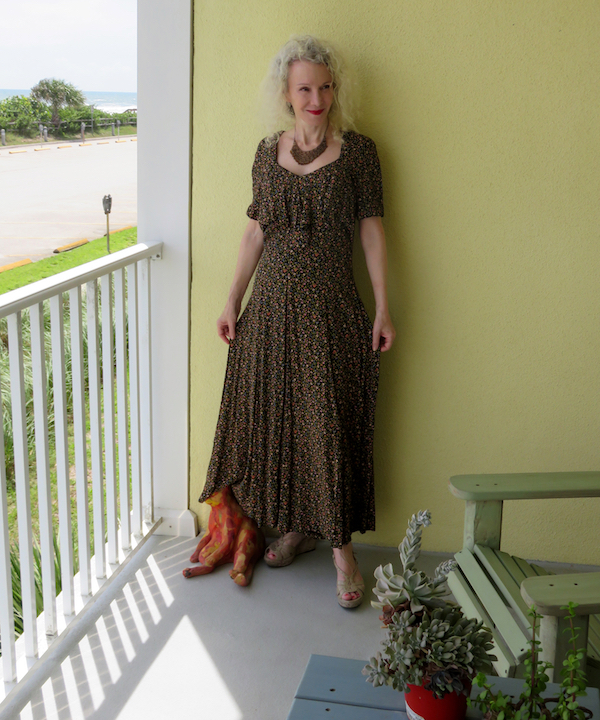 This lovely vintage 90’s dress was found at Citizen Rosebud, and it’s been a good friend throughout all the Florida seasons. Love this easy dress, the mini floral print and the ankle-grazing length. The ocean breeze is great for curly hair. You curlies knew that already, didn’t you? What a gorgeous dress! And your balcony is a great back drop, Patti. Pretty dress. 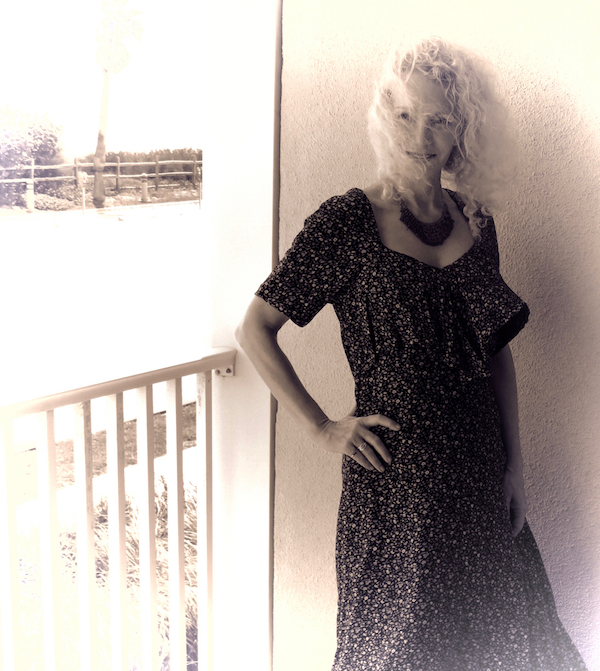 I am a fan of dresses, too, especially for the heat. And I love the lighting effect on that last photo: art. Patti, this dress is SO pretty on you, and the necklace is perfect. How nice that it was purchased from Bella! Hope you are settling into your new home without any issues. You look so great! I love dresses too, because of that reason! I too love wearing dresses. They are so versatile. Love this Fall transitional look, Patti and how that lovely dress feels bohemian. I’m loving the vintage dress! Dresses are definitely great for beating the summer heat! Thanks so much for the link-up, Patti! I love your dress and bib necklace – it took me a while to figure out the floppy (?) cat sculpture at your feet, ha ha! Looks like you have a wonderful view – congrats on the new place! The simplicity factor was the #1 reason that started my dress obsession years back. I used to say $25 and boom, you have a whole outfit! Love these dresses and the one you’re wearing! Congrats on your new apartment, Patti! Forget about the parking meters, that view looks amazing!!! I am so with you when it comes to wearing dresses. They have really become my uniform of choice during these summer months. I’m loving yours! The pretty print with the vintage necklace looks fabulous with your coloring! Love! Oooh, your flowy dress, so cool and pretty. I didn’t even notice the parking meters – I was so taken with the view in general. Congratulations on your move! Wow…that view! You must share more photos of your new apt!!! Dresses are the new whatever! You look so relaxed and cool in your flowy maxi dress. ooo, did I sound like an advert for pads?! Flowing, no. Easy, breezy, summery dress with really cool jewels to match. phew. Patti, congrats on your new digs. And I love that lightweight flowy floral print dress. Reminds me of day dresses from the 1930s. Very feminine and definitely perfect for Florida heat! Hooray! You’ve made it through to the other side of the move. What a view beyond those parking meters! Oh, I am loving this dress and your bib necklace with it! I can so picture it with booties this fall. I saw this dress on you on Instagram and I loved it and now I love it even more after seeing all of it! It will look really cool with your Doc’s (if I recall you do have Doc’s right?) too. Patti, this dress is so marvelous! I had so many dresses like this in the 90’s that I wish I still had! Although, they would probably be about 4 sizes too small for me now! Ha! I am itching for a thrift store adventure soon to find some cute retro pieces! You are radiant! And I think the lines/angles created by all the parking meters are kind of cool! Looking gorgeous in this flowy print dress. Love your hair blowing in the breeze. I wear dresses for the same reason, they are just so easy and effortlessly chic! You are so right about the ease of getting dress when opting for a dress. I’ve had getting a flowy floral print dress on my wish list for a while now and yours is just what I seek. You look fabulous in a wonderfully nostalgic and romantic way. Thanks for hosting. Couldn’t agree more, wearing a dress is the perfect solution for looking put together with little to no effort. Absolutely love this vintage find! Such a pretty dress, both cut and floral pattern. Dresses are an easy way to get dressed! Great dress & fabulous necklace ! You always look so lovely in a flowy dress! I hope you’re enjoying the new place. I’m with you Patti—a dress is easy, peasy! It always amazes me the women I meet, who never wear them!! But besides wearing a terrific dress…that necklace is quite stunning!! As for the wind & curls—why fight it, right? Very pretty dress on you, the colours are perfect for fall! Beautiful flow, beautiful print, beautiful view, beautiful YOU!! Love dresses which go across seasons! Thanks for the link up, Patti…have a great week. Lovely as always! I love dresses, too, the easiest way to get dressed! Looking lovely despite the breeze! That balcony looks gorgeous, more photos please!